Over the last week, I've seen several posts on twitter with the hashtag semicolonEDU. 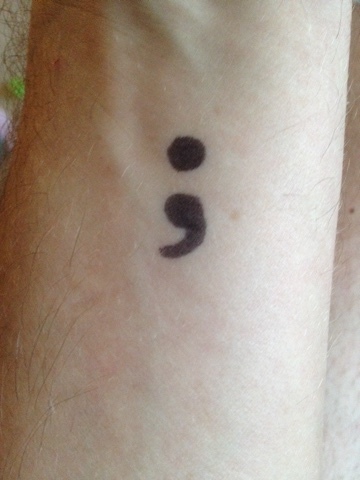 At first, I'll admit, I glossed over the posts having had no prior knowledge of what #semicolonEDU was about. But then I noticed more posts, and these included tattoos of semicolons, and strong messages of support and love for my friends in the twitterverse that were participating. My interest was snatached, and I started clicking the links (Project Semicolon Site and The Nerdy Teacher's site) to learn more. Not a Tattoo, but sharpy works! I love this. The idea of using the semicolon as a sign of hope. A semicolon is a writing tool. A symbol that most connect with English class and school. School, a place where the teachers are on the front lines of working and connecting with kids of all types. For me, this project means so much, because I take my role as a teacher seriously. My place in these kids' lives is not solely for teaching math, but to act as a role model, and for some a life coach. My goal each year is to have a positive overall impact on these kids' lives, so that they know in me, they have someone who believes in them. I know that my time on earth hasn't always been the easiest. My junior high experience was the worst. My self-value was in constant question, because I couldn't handle the verbal bullying, and at times physical bullying I went through. I was made to feel that I was never good enough, and I quickly believed it. My schooling was negatively impacted. I never felt like I had an ally at school. The teachers never seemed to care, and the kids were mostly just left to fend for themselves. I became an easy target because I was the kid that would easily cry. I never fought; it's not in my nature. So, to be heard, at home I would say that I would kill myself, or hurt myself. I guess in some ways I actually was considering it, since I remember spending a lot of time thinking about it. I would think about how scary it would be to die. I would wonder if anyone outside of my family would care. And in the end, I never truly attempted anything because I was scared. I was scared to hurting my family, because I knew how much they loved me. It was never about my friends, and I know that it was never about my own story. I just didn't want to let them down. As a teacher, I try to embody that role for my kiddos. I want them to know that I appreciate them. I try to tell them about my experience, so they can see that I made it. That I continued my story. We all have excellent stories to live, and the idea of a semicolon as a sign to remember that is just perfect for us educators. We're on the front lines, and the relationships that we build with our students strengthen the continuation of their stories. I want to thank @thenerdyteacher for blogging about Project Semicolon, and sharing it with our wonderful PLN on twitter. Please use the comments section to tell your story or add your thoughts.